Yesterday the lovely Morgan Hoffman, who interviewed me on InnerSPACE recently stopped by Arts Market to see my handmade treasures! 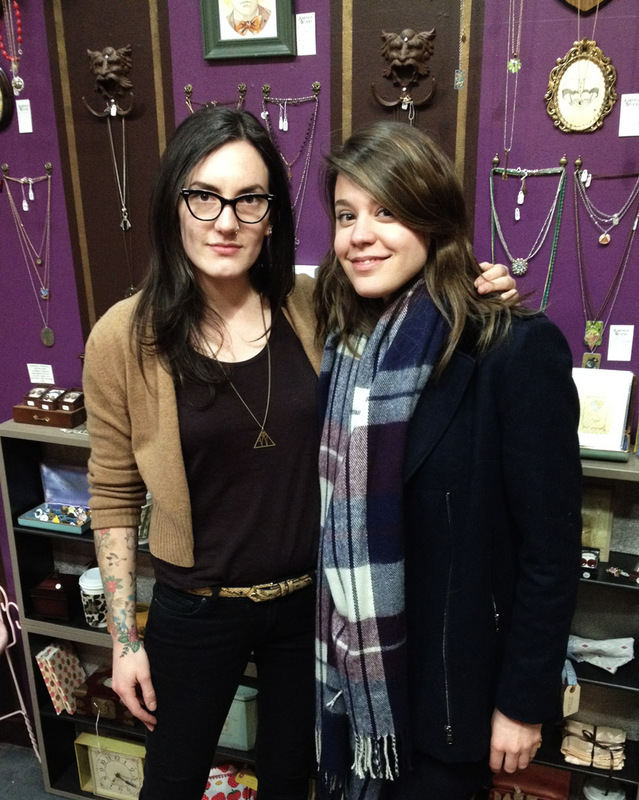 Clearly a woman of taste, she picked out my favourite Mechanical Heart pendant and a great vintage bracelet. I am happy to see this piece full of laboured love go to a great home. Space Channel fans, keep an eye out, you may catch it on a future episode of InnerSPACE! Photographing some colourful things around my apartment between projects boosts morale. Above: some of my Catwoman and Batgirl figures. Left; antique postcards of a skull pile and dreaming woman + mid century Japanese cat that belonged to my mom. Antique key necklaces can be found at my Arts Market shop! Be sure to email info@amindawood.com if you see a piece you want that isn't listed in my online shop! Marta models this recent arrival, vintage wool jacket, made in France. This and other pieces have re stocked the rack this week. A few new arrivals; antique key, rhinestone mini bow pendant, decorative embossed pendant and bow bracelet. Tucked away in a pile of junky discarded vinyl at a thrift shop in Barrie, this album was recovered by a friend with an eagle eye for records. It was just waiting for a lover of equal parts Art Deco and Batman such as myself to take it home and revel in its glorious design. Barrie brought many good finds, including a great haul of vintage spring clothing that will be available in my boutique at the back of Arts Market as the winter comes to a close. When good clothes find great homes! Meet Jacqui and Samantha. They totally made my day Saturday at Arts Market! We all had fun while they tried on a ton of great outfits. It's always a treat for me when pieces that are meant to be together, go home together. I look forward to the next visit from these lovely ladies, it was such a pleasure! A picture perfect example of the great looks you can put together when you pay my vintage clothing section a visit! Arts Market voted one of Toronto's best spots to shop local! Most of you probably won't even recognize this crazy mess that was once my workspace at Arts Market! Back in 2011 BlogTO wrote an article about some of the vendors at Arts Market, featuring yours truly. You can find it in this article listing a selection of other great stores in Toronto where you can keep it local. You can read the article here.